7 Reasons Why ‘Janus v. AFSCME’ Supreme Court Case Threatens Safe Patient Care Across U.S.
1. When hospitals cut corners on spending, they cut corners on human lives. From pushing patients out of the hospital while still ill, to stocking lifesaving supplies at a bare minimum, to having no limit on how many patients they assign to one overwhelmed RN, hospitals often make decisions that are good for profits — and bad for people. Who best standup for patients in those situations? Empowered union nurses. 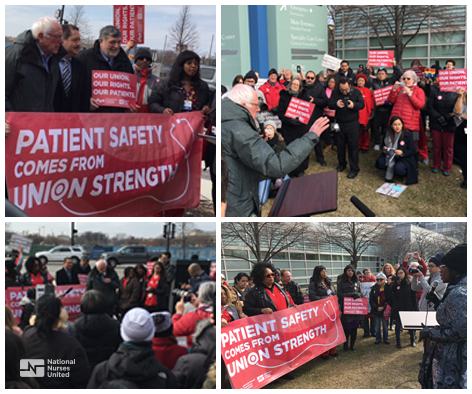 US Senator Bernie Sanders join nurses and supporters at a rally on Feb. 22 outside John H. Stroger Jr. Hospital of Cook County in Chicago. 2. Unprotected nurses = unprotected patients. When nurses see a threat to patient safety, they must be able to speak up without fearing retaliation, thanks to the backing of their union. RNs with strong unions are more effectively able to challenge employers that want to cut patient care services, close hospitals and clinics, and force nurses to work in unsafe conditions. 3. Nurses know better than billionaires. Bankrolled by billionaires and corporate CEOs, “Janus” encourages employees to refuse to pay dues, while they enjoy the rights and benefits of a union contract and representation. A not-so-hidden goal is to decimate unions financially, crippling workers’ ability to challenge employer abuses. Nurses need union support to ensure profits for the rich and powerful do not come at the expense of public health and safety. 4. “Right to work” laws threaten public health. Janus is based on so-called “right to work” laws now in place in 28 U.S. states. In those states, household incomes are more than $8,000 less, people under 65 are 46% more likely to be uninsured, life expectancy rates are lower, and infant mortality rates are 12% higher. 5. Attacking nurse unions also jeopardizes patient care in non-union facilities. 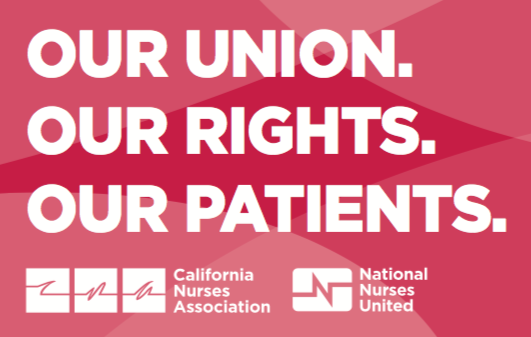 Because RNs in unionized facilities are better able to advocate for and win critical patient and nurse protections, non-union hospitals sometimes match these protections simply to keep their nurses from leaving. When union protections are destroyed, working conditions — and patient care conditions — in non-union facilities will also suffer. 6. “Janus” sets stage for silencing ALL nurses. “Janus” currently applies to unionized workers in public settings, but it sets the stage for a future case to disempower all unionized U.S. workers. This has already happened in the 28 states that have enacted so-called “right to work” laws. For patients, that would mean a future of disempowered nurses, no matter where lifesaving treatment is sought. 7. Case comes during flu epidemic, opioid crisis, when empowered RNs needed most. With thousands of U.S. patients dying in an especially harsh flu season, and an opioid crisis killing more than 115 Americans per day (according to the National Institute on Drug Abuse), our healthcare settings need a strong voice for safe patient care. Nurses are that voice. Weaken unions, and patient care suffers, at a time when we need strong nurse unions the most. National Nurses United, with close to 150,000 members in every state, is the largest union and professional association of registered nurses in U.S. history.